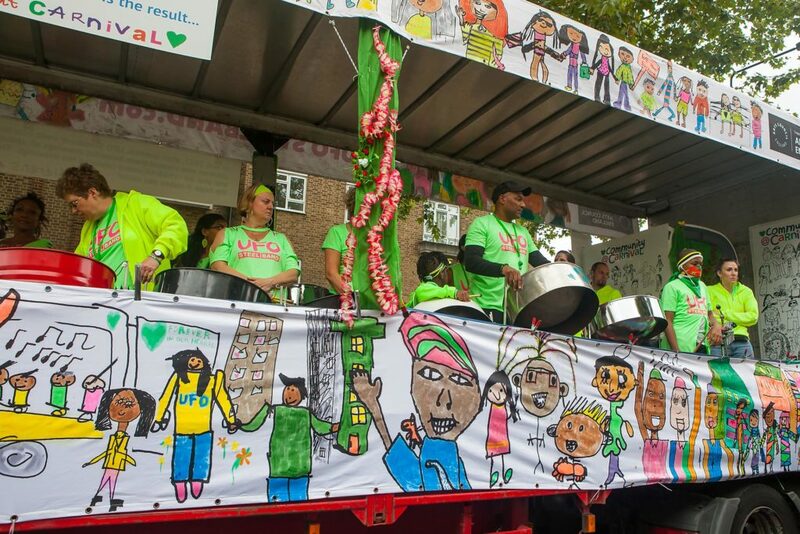 Back in June we were hoping that our Arts Council funding application might be successful, and we were dreaming up potential designs for our truck, hoping to be able to stage the band at 2017 Notting Hill Carnival and The London New Year’s Day Parade. 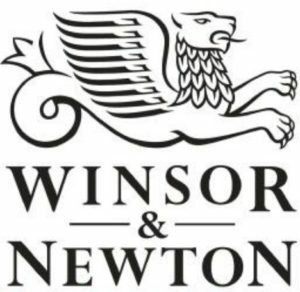 Then we heard it had been successful – our dreams for our new project would become a reality – we were celebrating and started planning! But a few days later the Grenfell Tower tragedy happened. 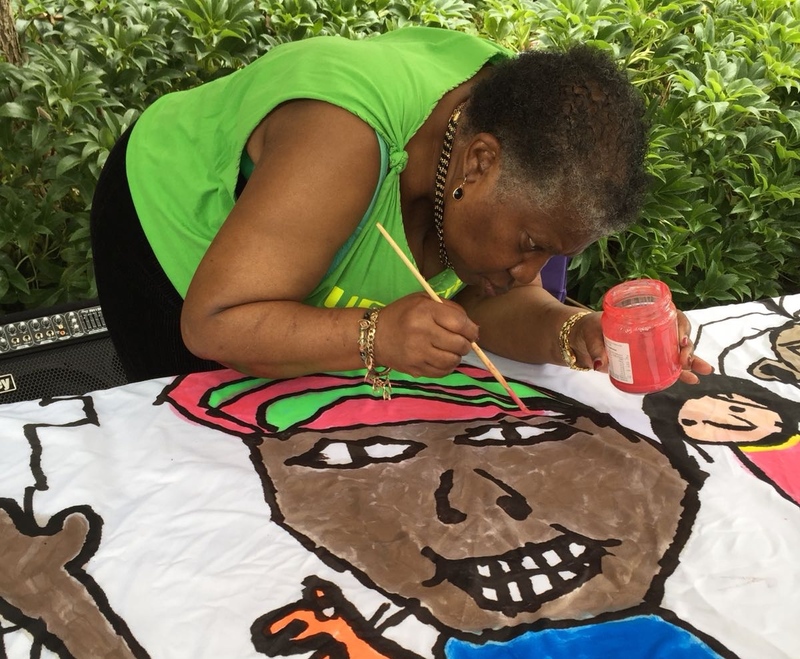 Many of us live in the community and were directly affected. 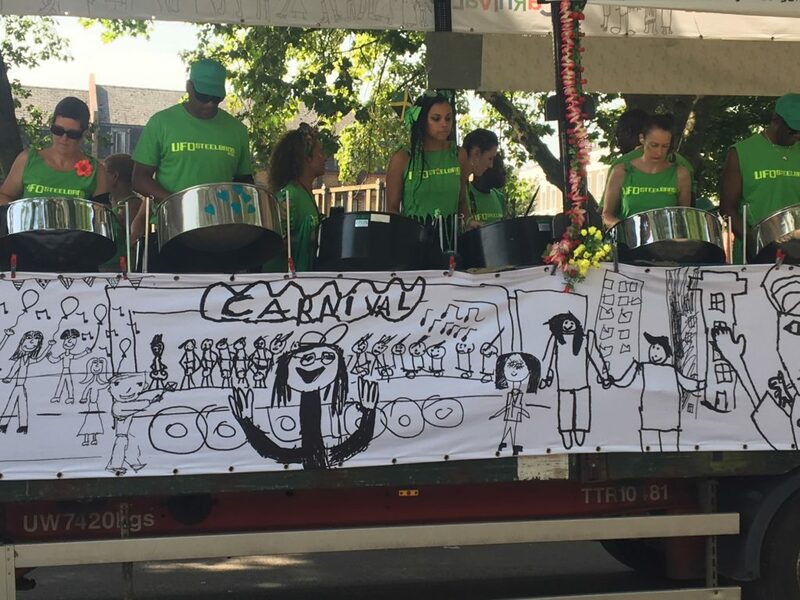 Everything had changed, and there was now a question over whether or not Notting Hill Carnival should even go ahead – how could we revel in the shadow of the tower? 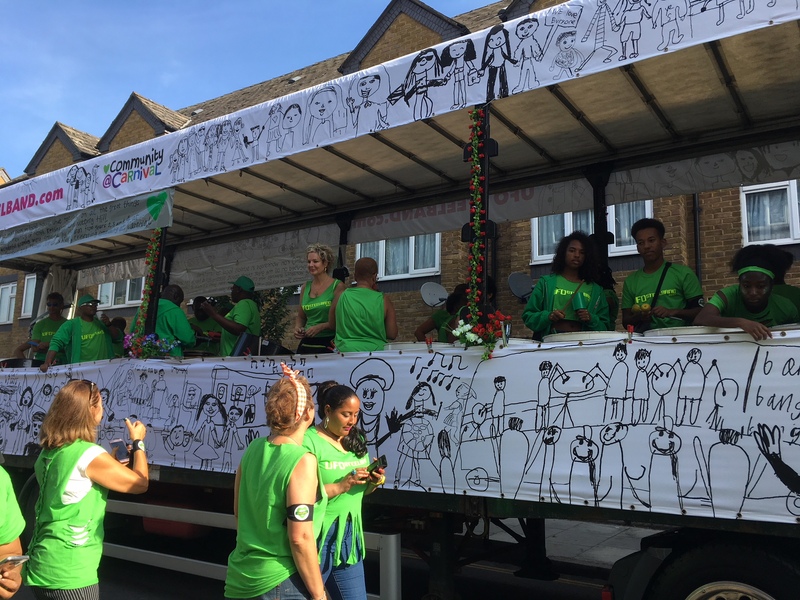 Amid a terrible time, the Carnival community and local people contemplated, considered, discussed. 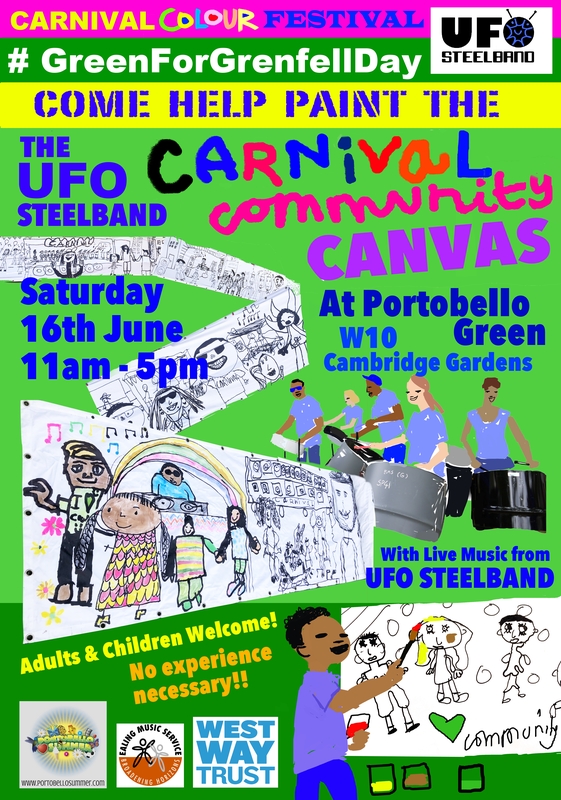 But Carnival has always brought hope amid adversity; we remembered that Carnival itself originated as a message of joy, community, music and fellowship amid times of difficulty and oppression – Notting Hill Carnival had to go ahead and we had to find a way for UFO’s input to Carnival to have respect and integrity within our tribute to Grenfell. 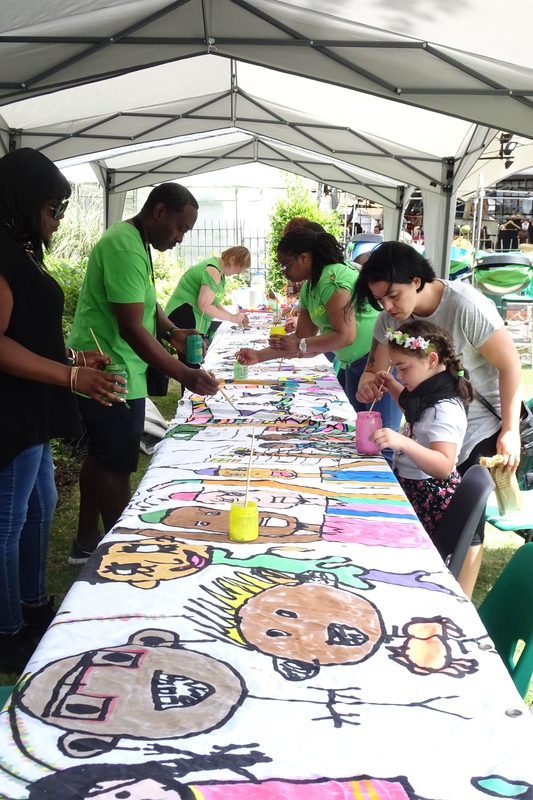 Grenfell brought an outpouring of community support and voluntary projects. 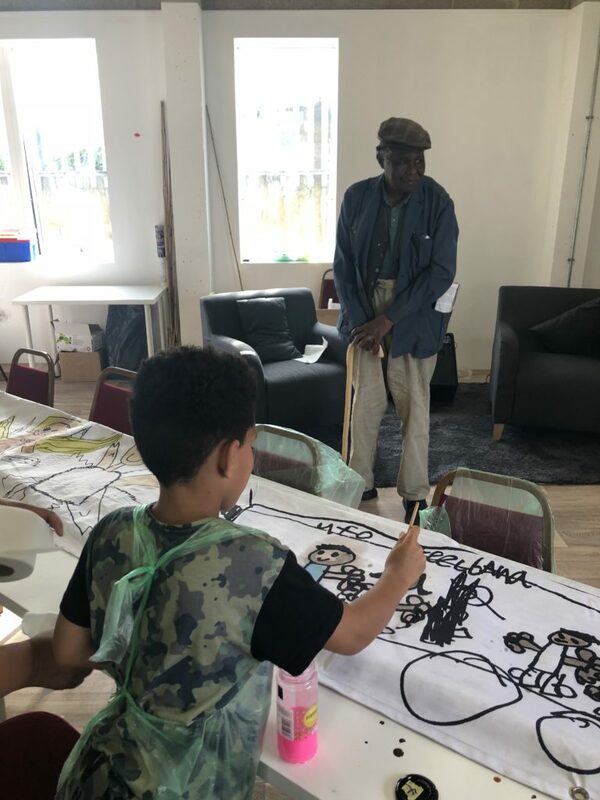 Like many people in our community I helped in a local volunteer centre – during those first few weeks while the community began to come to terms with what had just happened. 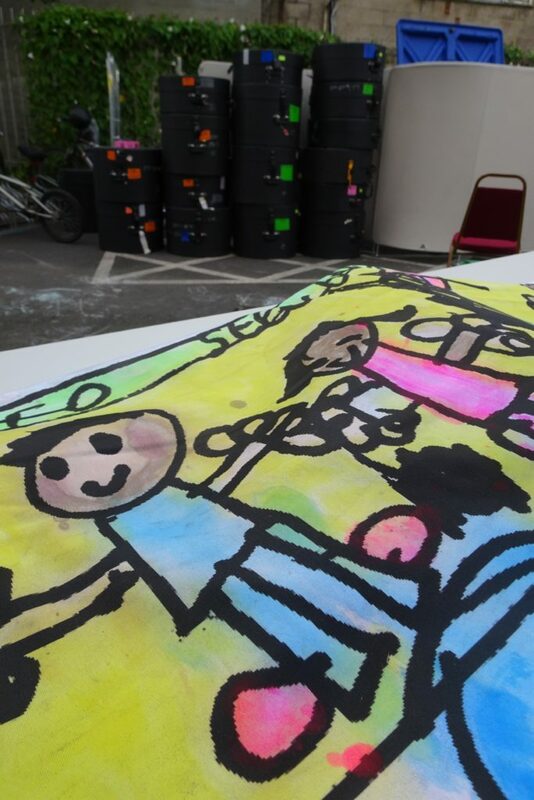 We tried to work out how to best receive, sort, package, move and share the overwhelming abundance of donations that arrived daily in Notting Hill and North Kensington, from all over UK. 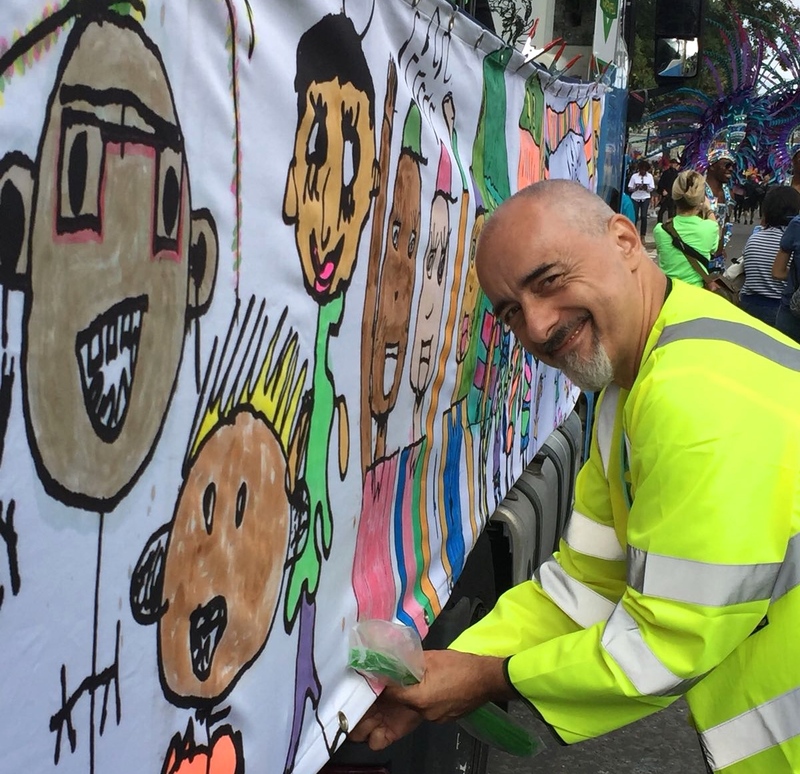 It was a distraught and unforgettable time, and I was thankful to Notting Hill Carnival – many years of running Fox Carnival Community Arts projects in schools had given me valuable teamwork and project management experience. I could call upon these skills to give me focus, and I was quickly able to step up and team lead and , which I hoped in some small way helped. 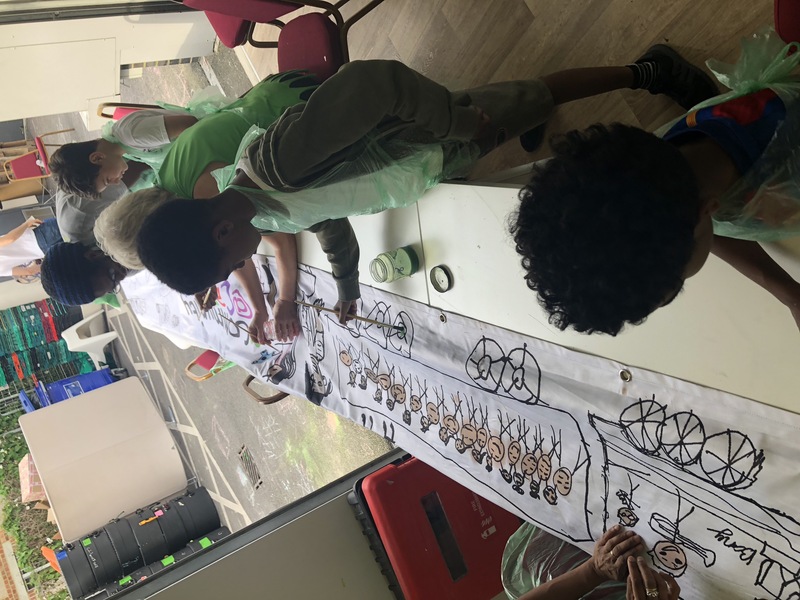 In my mind all that time was how could we use our experience of leading children’s art projects to help in schools where staff were on the coal face of dealing with children’s trauma. 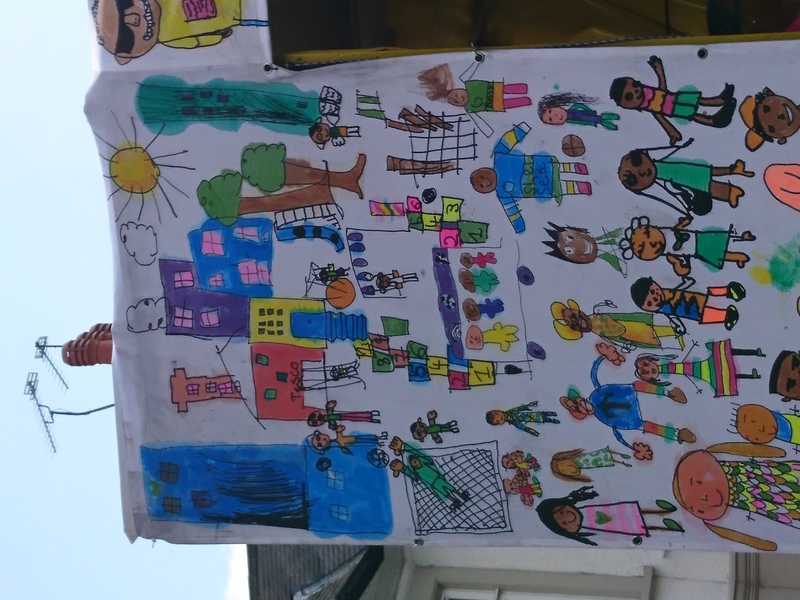 In relation to Carnival and using our arts funding ring-fenced for banner design, I wanted to find a way of creating a project that could give a message of hope, bring some kind of joy at this terrible time. 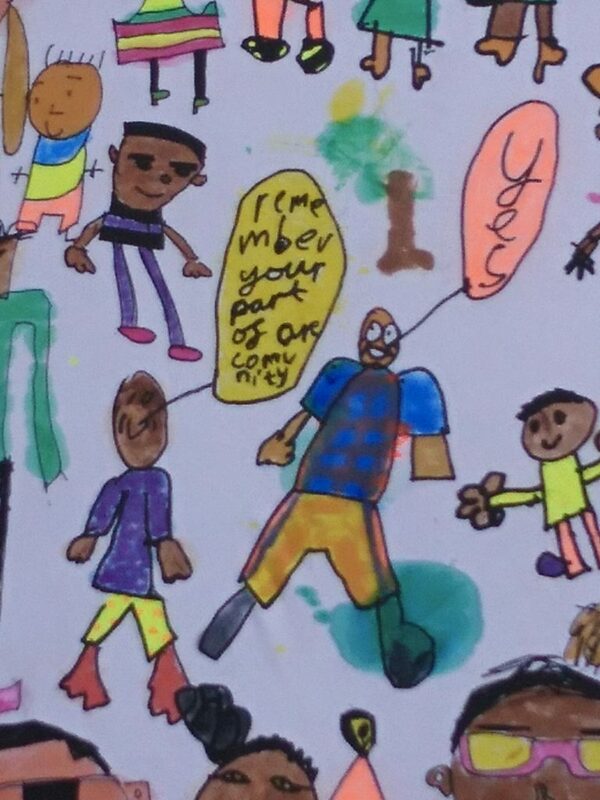 The answer I felt lay somewhere within a children’s art project that we could bring to the public at Carnival. 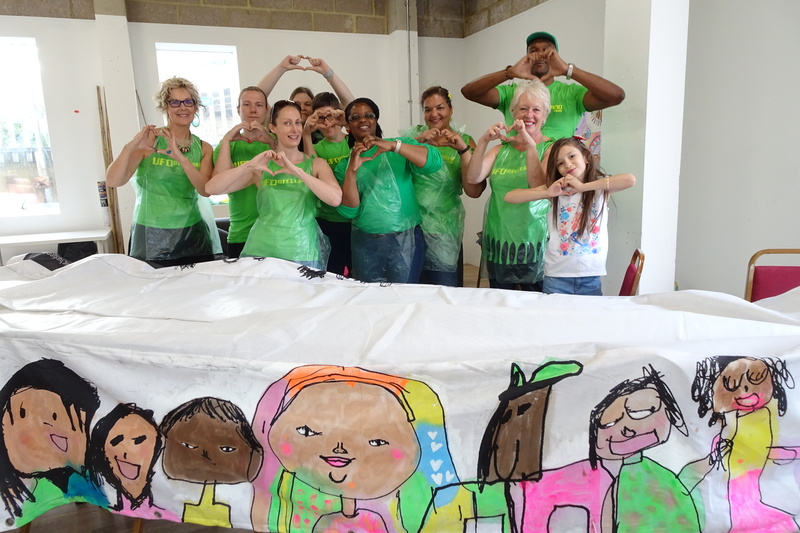 Three weeks after Grenfell our project was ready to deliver. 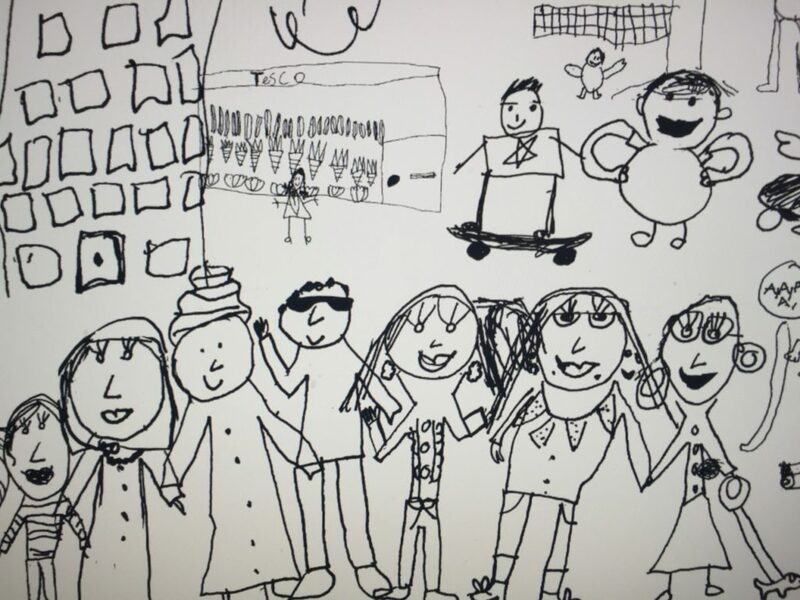 Having led many years of arts projects in local schools, the head teachers welcomed us into classes that were traumatised or directly bereaved. 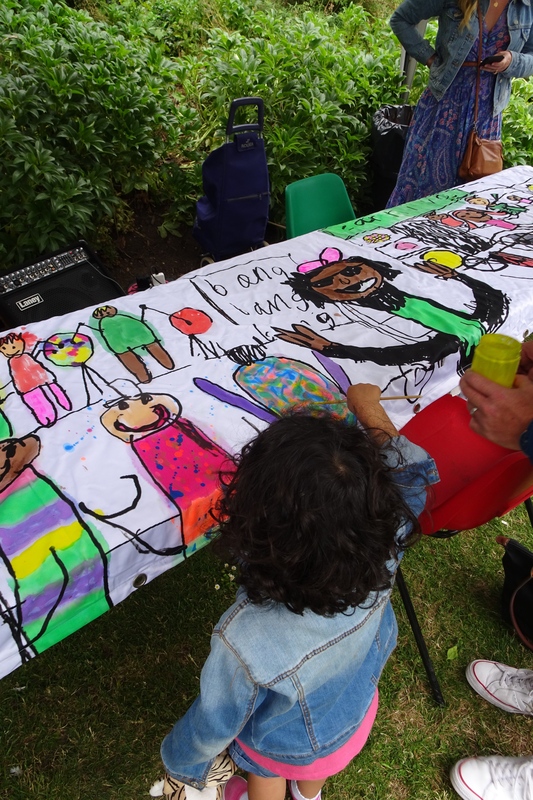 The aim of our design brief was to enrol the children in the idea of making drawings about community, then to bring the drawings – as collaborative murals – to the public. 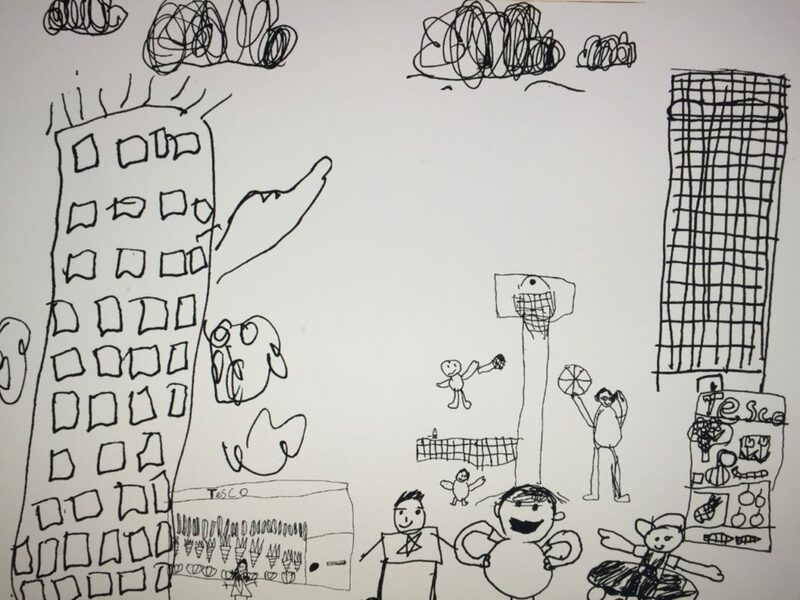 We talked with the children about what community means, how it will survive, how we can help people smile again. 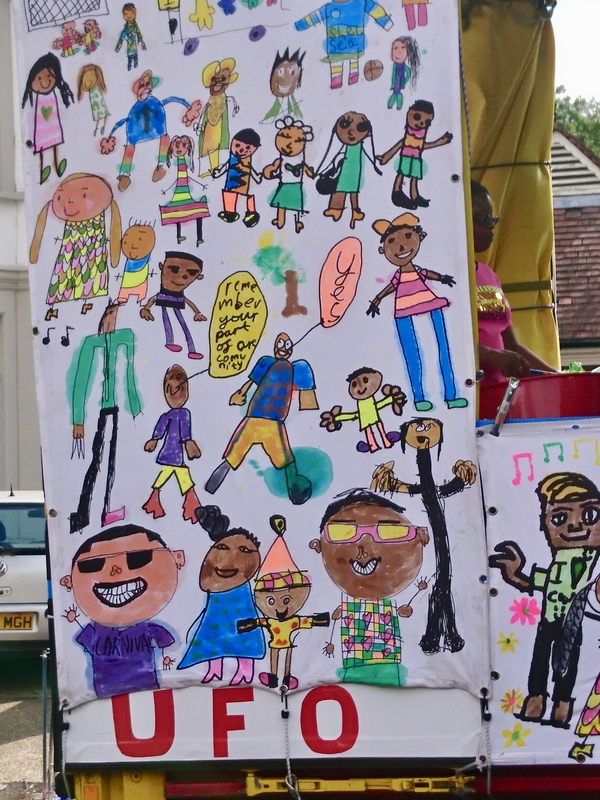 We talked about the colour and joy of Carnival, about what it means in our community. We looked at photos of large trucks – how those huge artics that deliver supplies to Ladbroke Grove’s Sanisbury’s are transformed at Carnival into moving stages holding steel bands. We talked about how these trucks can be decorated and how the UFO truck could look amazing if it was covered with children’s art. 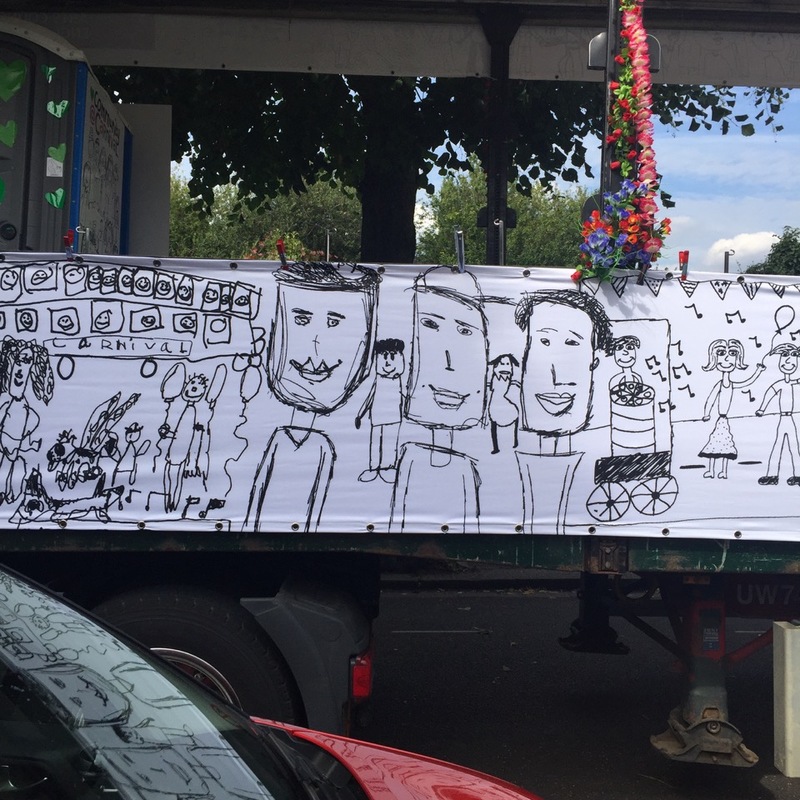 We hoped this would give a message of the joy as community as the truck went by. 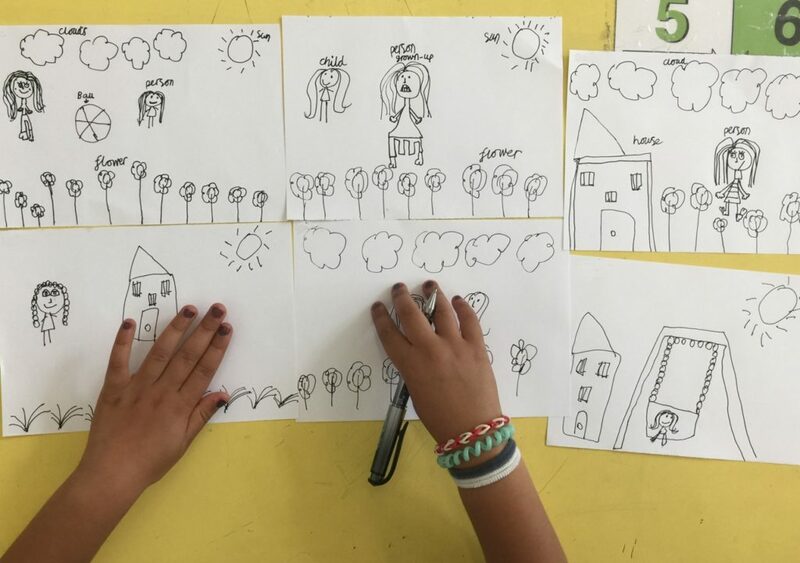 The children completely understood the concept and created their drawings with exuberance, expression, beauty, kindness and generosity. 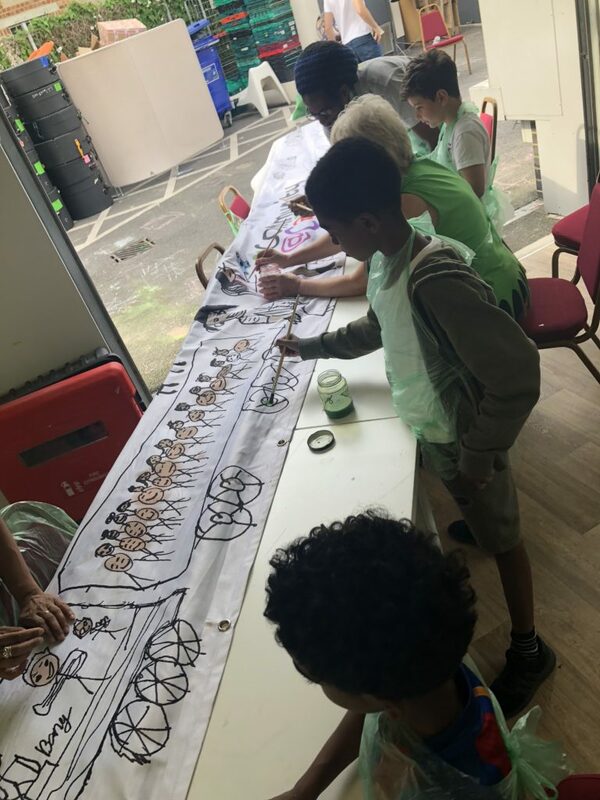 This was a quick project – only 45 minutes to one hour in several classes – but it was effective, and a fantastic success, and teachers offered it to more and more classes right up until the last few days of term. We ended up with 400 amazingly beautiful and compelling images of people, activity, buildings, gardens, sunshine – which I collaged digitally in my studio into collective scenes. 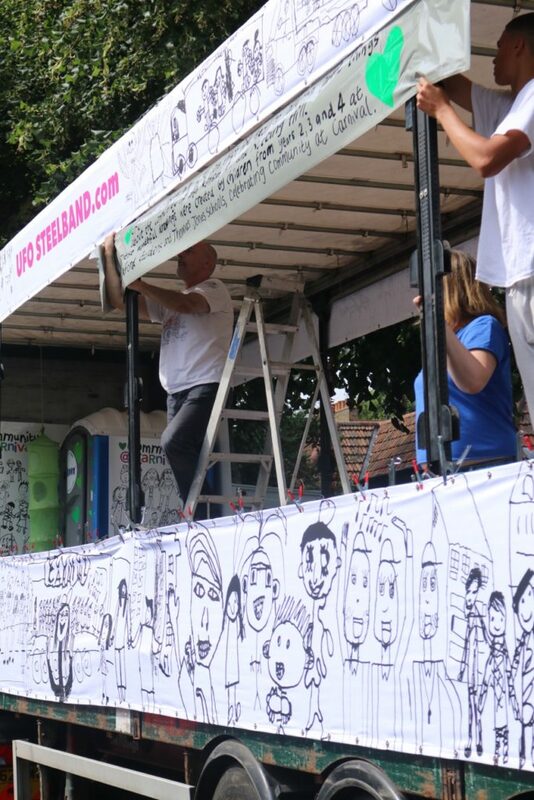 These were printed on to 12 meter canvas banners designed to completely wrap the 45ft articulated lorry. 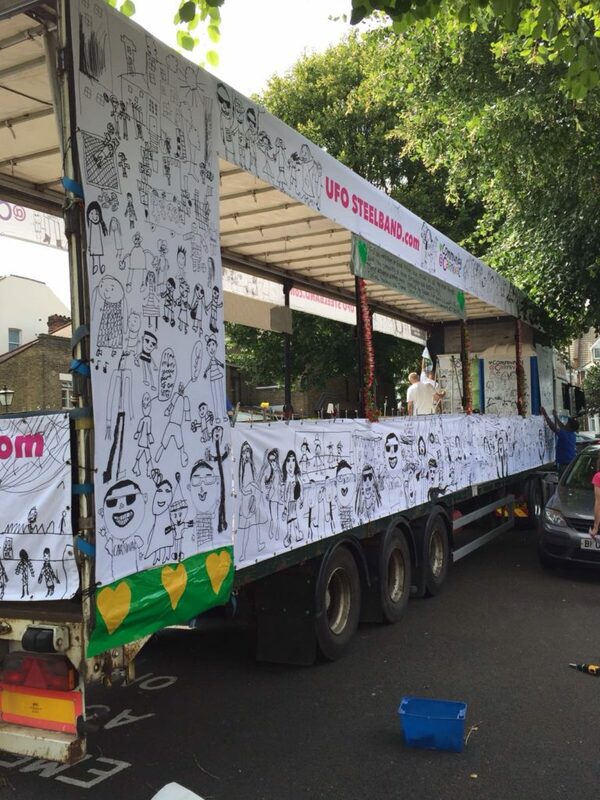 It was moving at Carnival to see people’s reaction to the artwork. 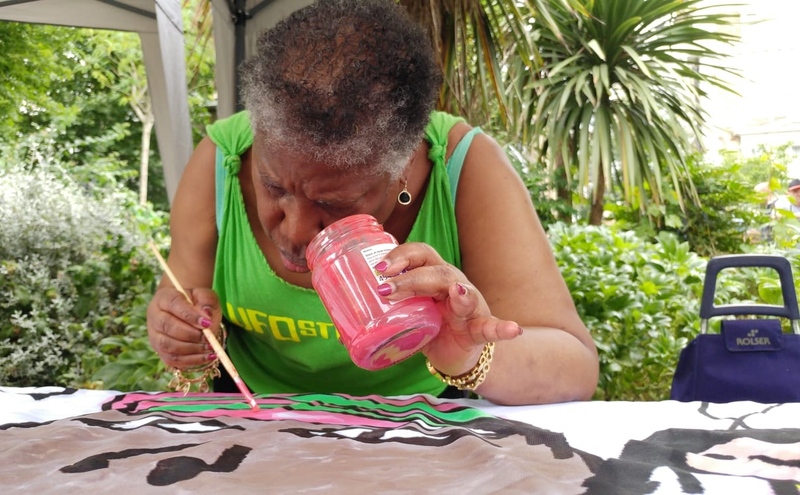 One woman told us with tears in her eyes that she had lost family in the fire: “This is the first thing that has really makes me feel joy since – thank you.” She stayed with the truck for most of the day, dancing to the steel pan music and we journeyed through the carnival route. 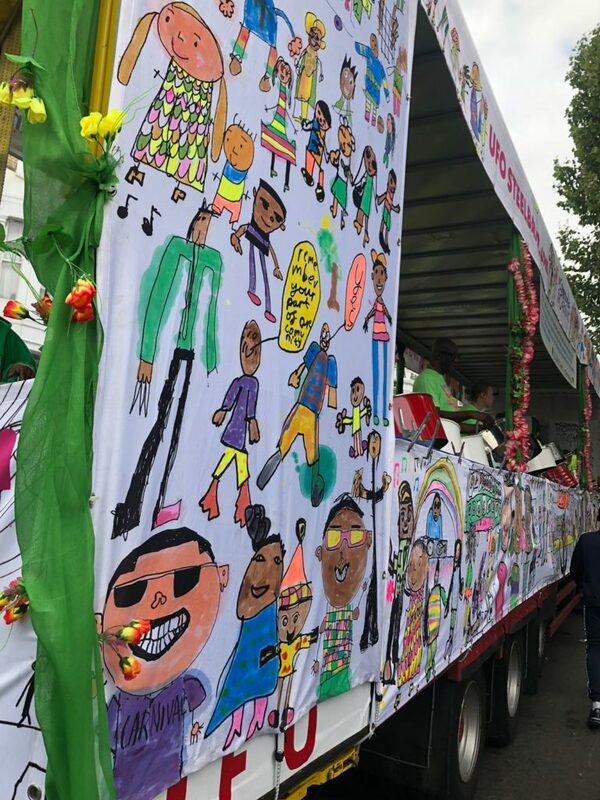 Some children in the crowd were ecstatic to recognise their little piece of art within the large designs on the truck – a little character or a scene they had drawn. 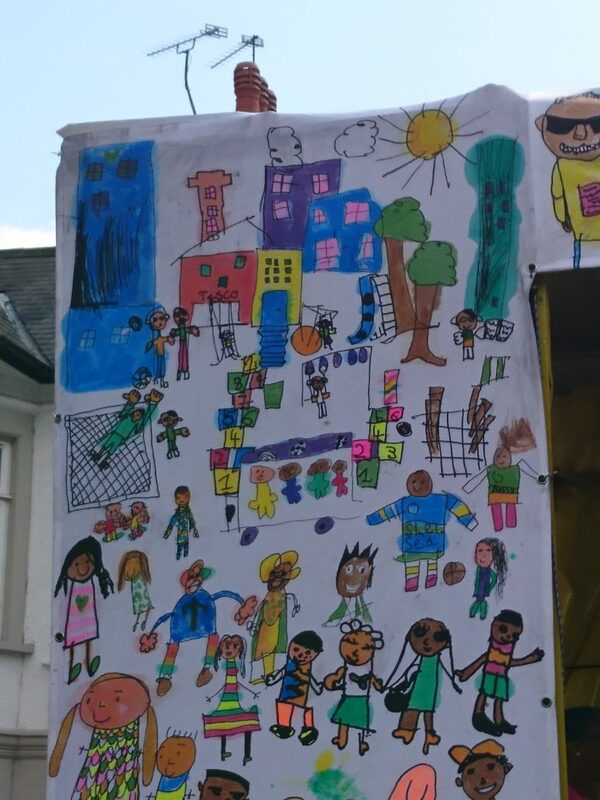 People just got it – the children’s art said it all. 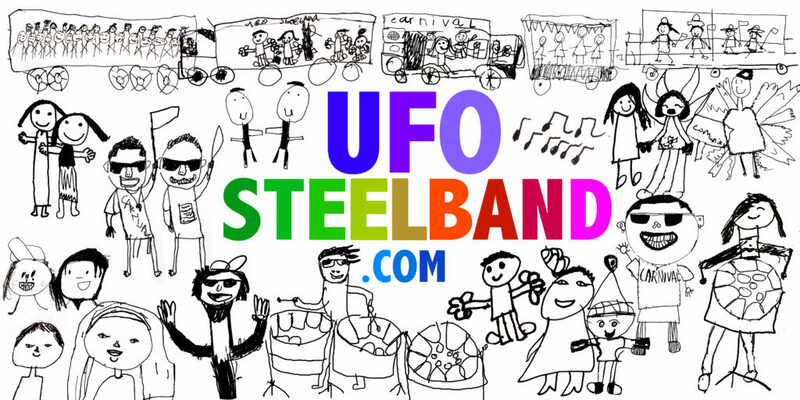 Thank you children for making the truck something UFO Steelband were proud of. 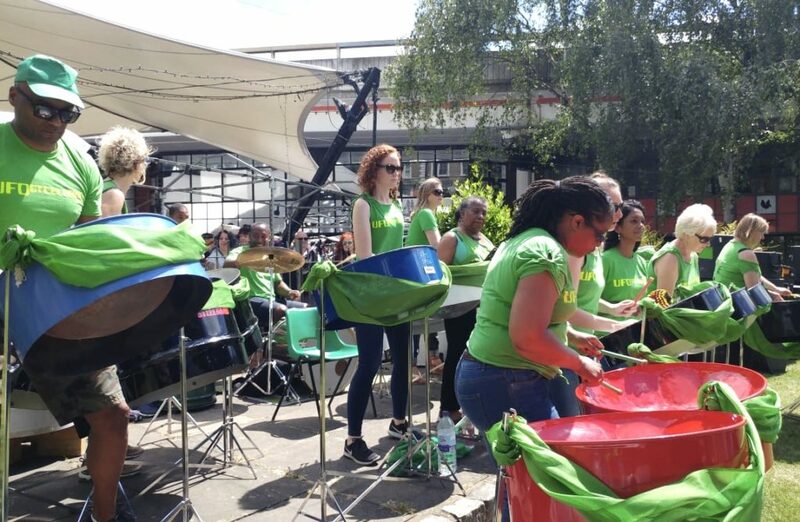 We were proud to display the vibrant, generous expression of children, proud of the joy it brought to audiences, and – most of all – proud of the message collective shared, that we must never forget Grenfell, that we must learn form this terrible tragedy, that it can never happen again. The vast and empty 45ft articulated lorry stood under the trees, conveniently parked on a blocked residential street in Shepherds Bush. From experience, we knew there was a LOT to accomplish in the several hours allotted, even with all hands on deck. So in the midst of a busy, active, exciting and almost chaotic atmosphere, the banners were unfolded and we all felt their impact. 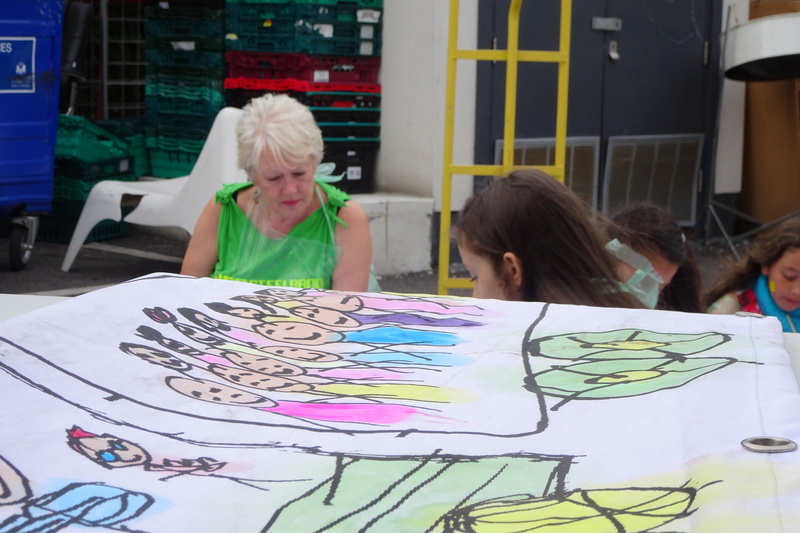 Work slowed as we took in what had been achieved in Fiona’s workshops. 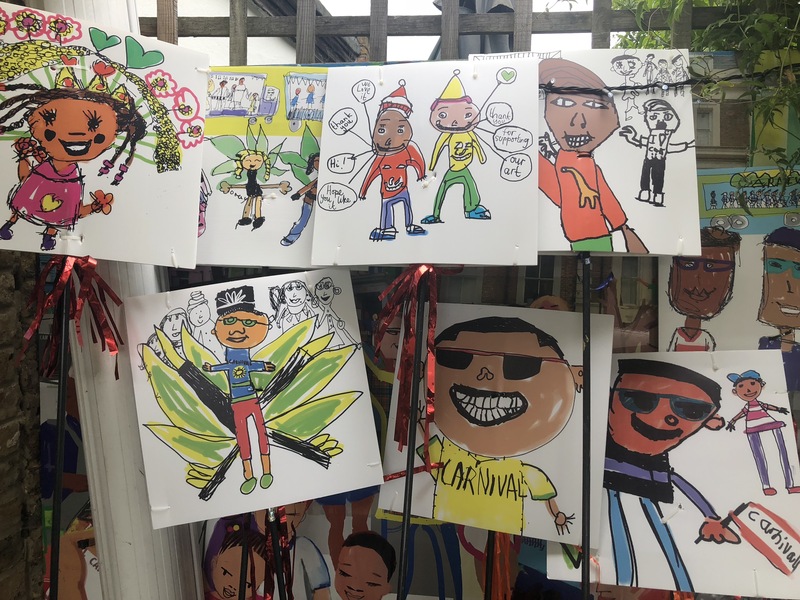 The drawings by children local to Grenfell Tower told a powerful story – of the importance of community and friends and music and carnival and creativity – in a way that many adults were struggling to express. 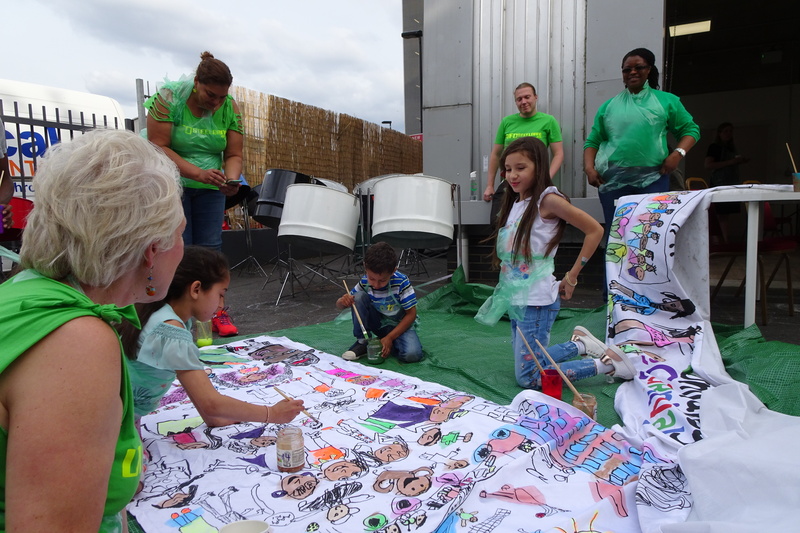 Individual drawings voiced smaller stories – hopscotch, skateboards, steel pan, super heroes, an impressive sound stage, and lots and lots of friends holding hands – and collectively they provide a powerful, beautiful testament to the resilience of hope and the importance of a shared community. 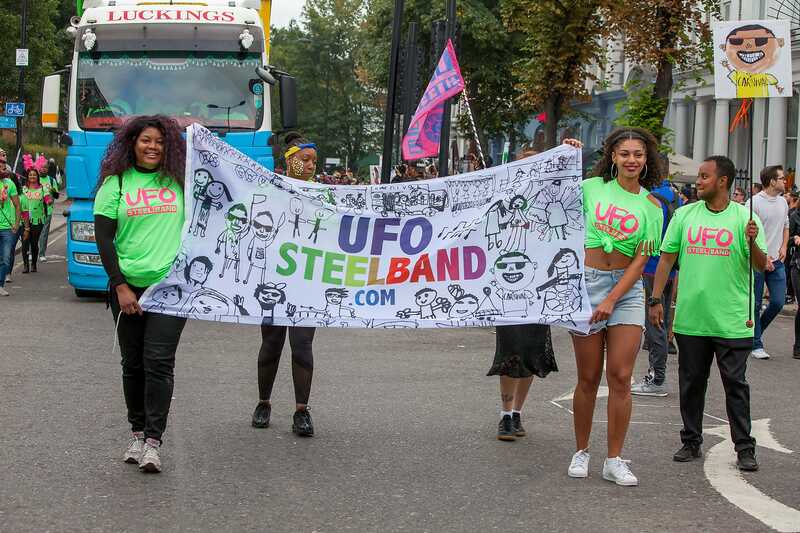 UFO MINI FESTIVAL OF COLOUR ON CANVAS!!! 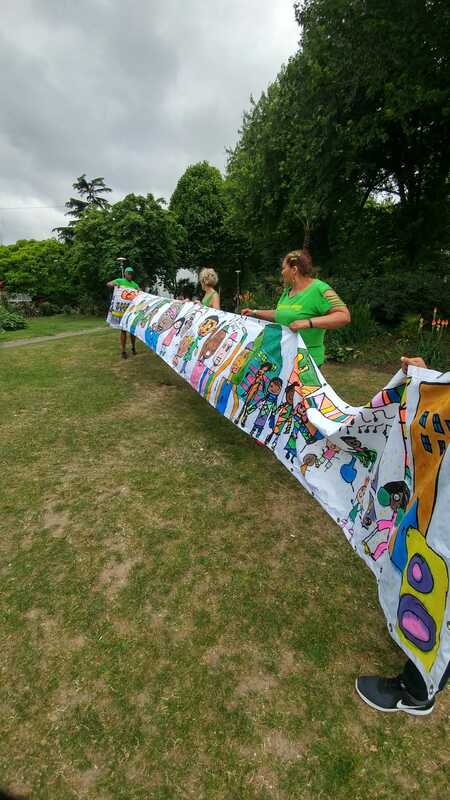 The 2017 banners were beautiful, but we had put them away after Carnival 2017. 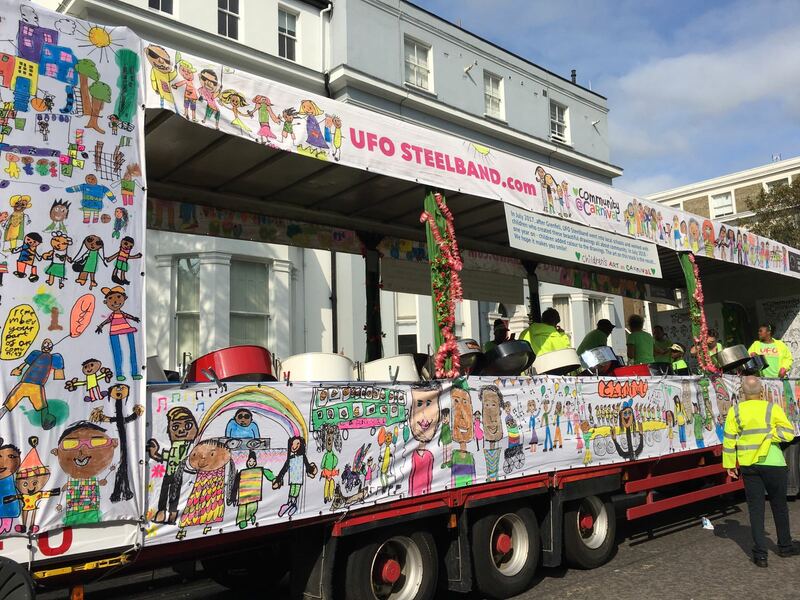 When it came to planing UFO at Carnival 2018, we wondered if we might bring them out again… could we show the children’s art to the public at Carnival for another year? Could we make the banners even better? 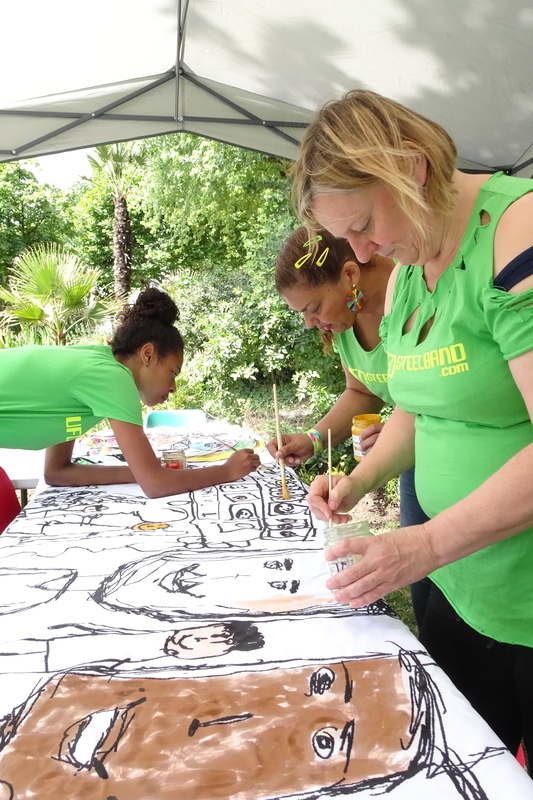 After weeks of considering and planning and raising funds, we found a way forward… to add colour to the banners! 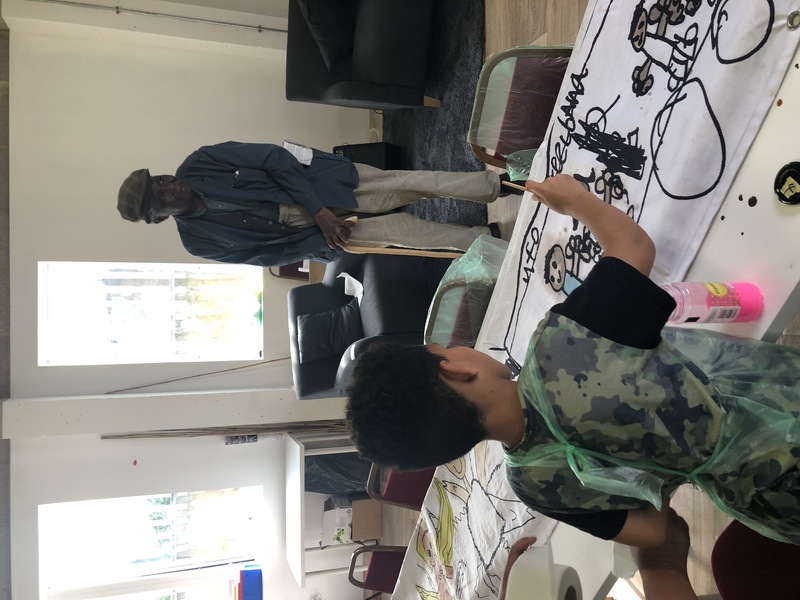 This happened via a new project to run a series of workshops at “The Curve” Grenfell Support Centre, and at Notting Hill/North Kensington’s “Portobello Green”. 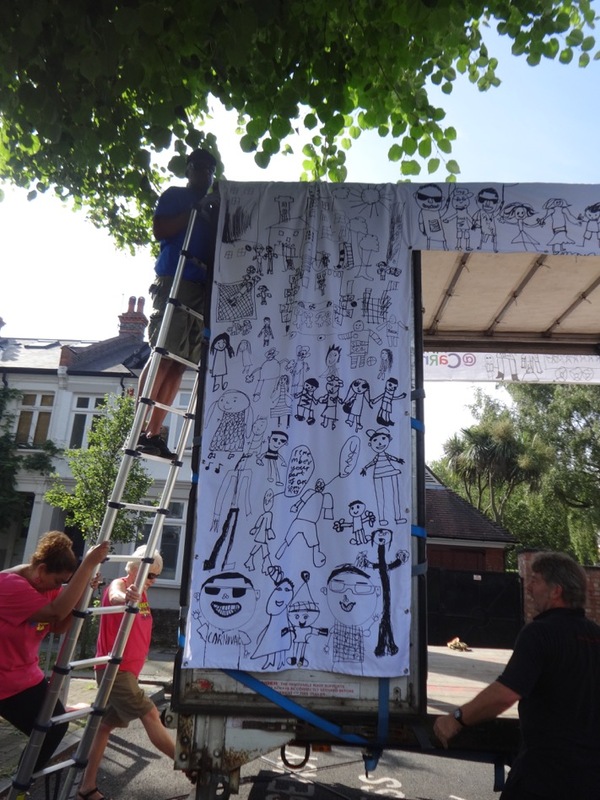 In fact it was more than a project – it was a mini festival! 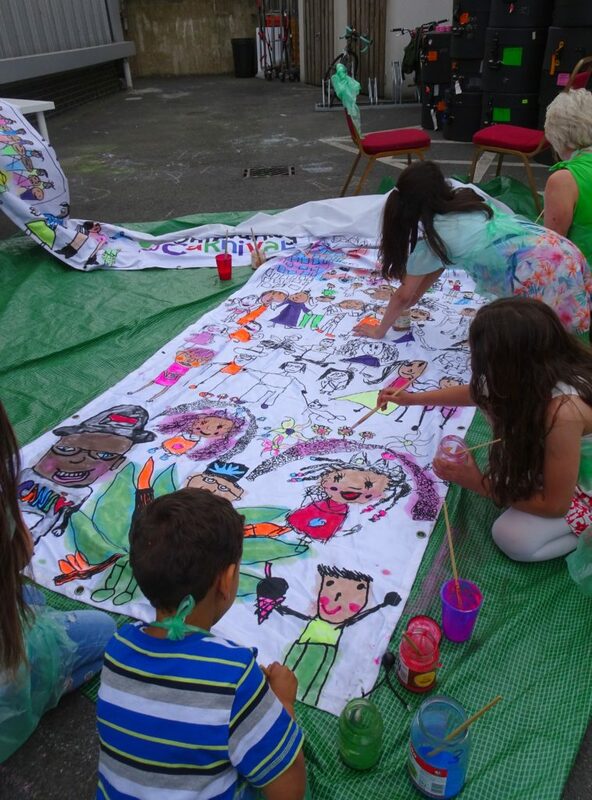 We set up a series of public events combining music and art-making, and invited the public – particularly children – to come listen to UFO play pan music while we led sessions for participants to collectively paint and add colour to last year’s banners… we had 50 square meters of canvas to colour, which required a festival!!! 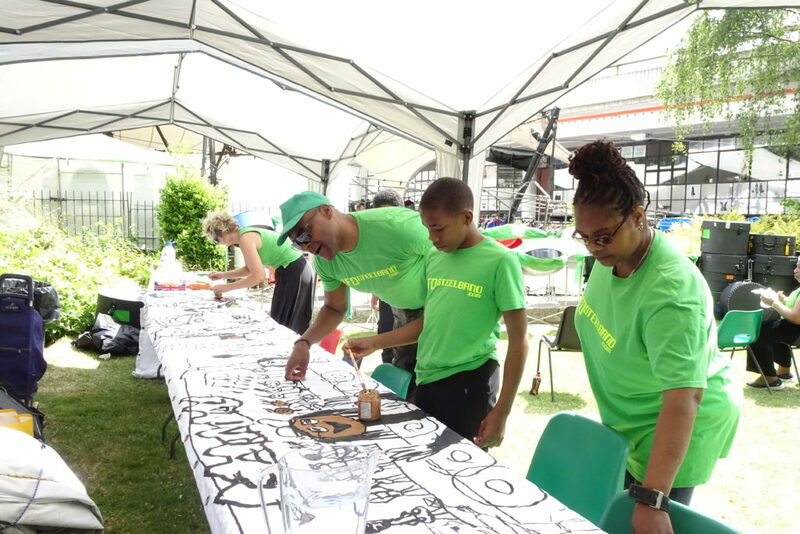 Thanks to Westway Trust – who part funded the activities, and to Windsor and Newton who gave us acrylic paint – this festival could happen… without their support it would not have been possible. 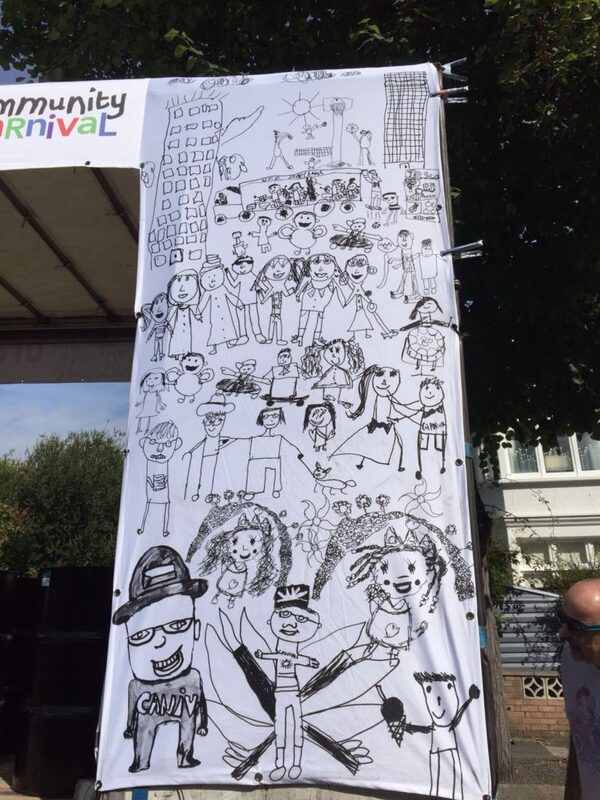 The festival was a complete success. 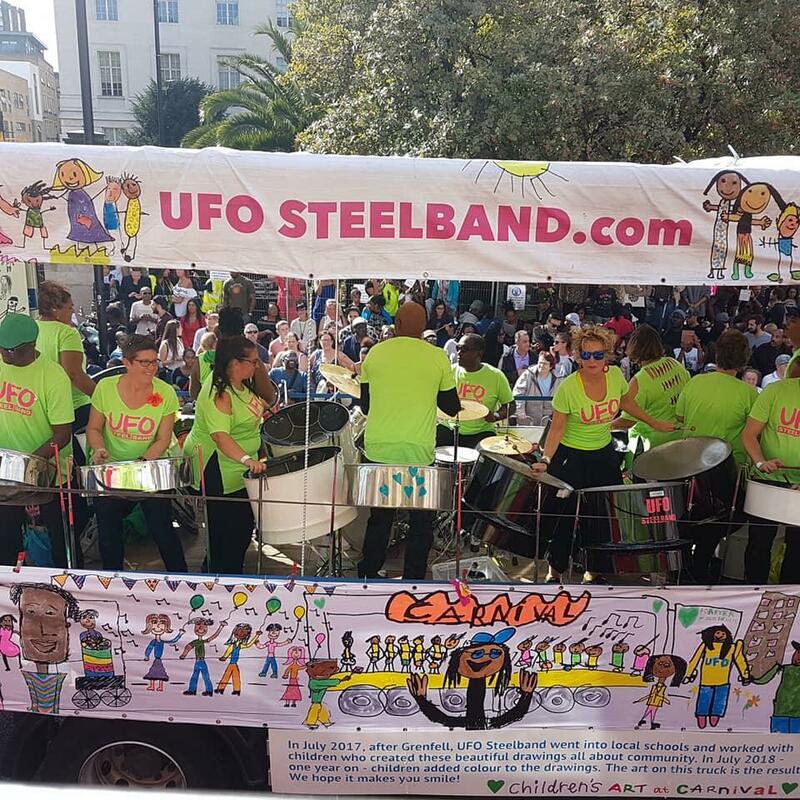 We spread out the banners on tables, and created a steelpan musical backdrop to enjoy while we worked – that way everyone involved could think of the larger festival we were collectively working towards… Notting Hill Carnival. 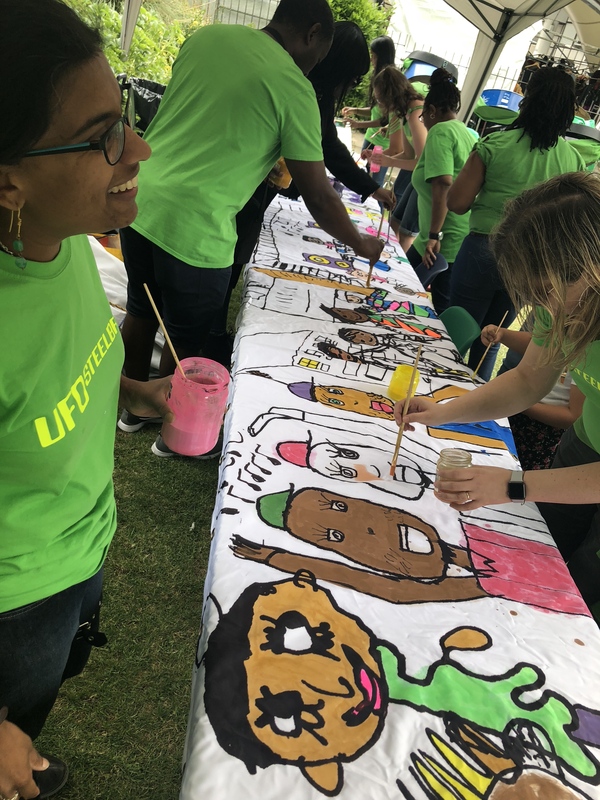 While everyone painted, we talked with the participants about impact of colour when seen by the public at Carnival… what effect it would have? Would it lift and make people smile? Should colour be clean or muddy? If clean colour, how do we achieve that? We explored which colours work, and if colours should be heavy or washy, so that line could still be seen? 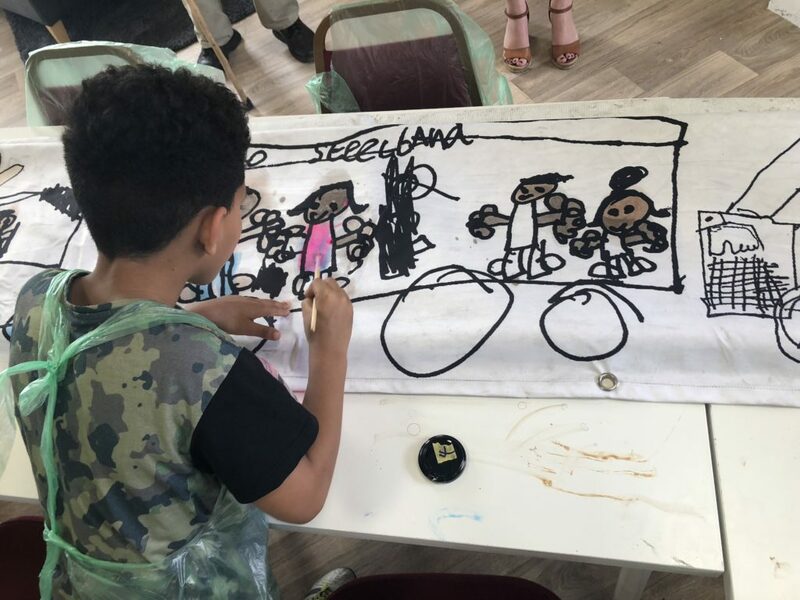 Children’s input defined the project – the courage of their marks and their honest and straightforward views helped make a good result! 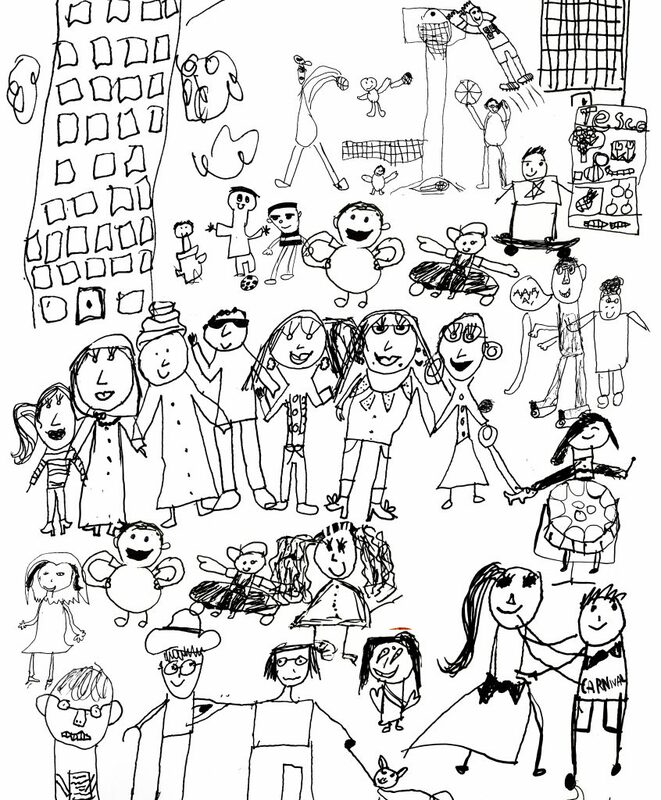 Most importantly, everyone got so much from painting together. Children realised that they often have more confidence than adults when it actually comes to putting paint on canvas – so they taught the adults, something they said they likes because it is “something we don’t usually get to do.” This was empowering and confidence building for the children, and it was a chance for adults to really understand that they can learn from the courage of young people! 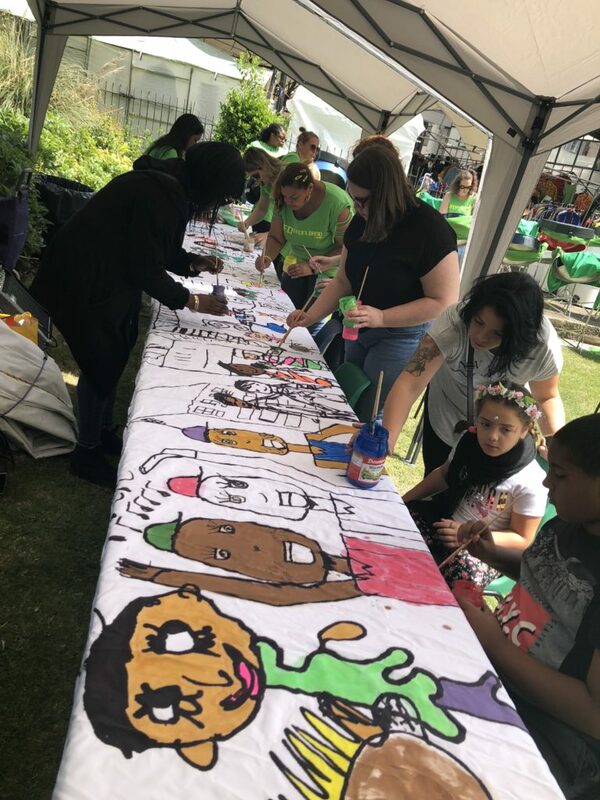 We thank Westway and Winsdor and Newton for their support, and we thank all the participants – the children and adults – who worked together to create wonderful, joyous, colourful art.